Stadium of the Year 2012: Arena do Grêmio! We knew beforehand that this stadium will be a strong Nominee, possible candidate for the podium. No retractable roof, no mobile pitch, but what many believe a proper football stadium should look like. It wasn’t the world’s most expensive as well, but still earned a massive number of 29,627 points in your vote! We’re sure the terraced Geral stand played a role here and will now cause even bigger controversy. Some love the fact that Grêmio decided to include fans’ expectations in the design, while other claim this is what caused the unfortunate accident in late January. 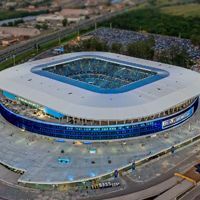 We believe the case is far from being as simple as that and respect the fact that Grêmio at least tried to meet supporters’ expectations, while most stadia nowadays are rather built to maximize profit. Besides, who said one has to be opposite of the other? Massive number of skyboxes and huge capacity overall make the stadium seem like almost perfect combination of modern and traditional football. Together with very interesting design this may have been why many people thought: this one deserves to win. Of course Brazilian voters, very high in numbers, were probably Grêmistas most of the time, but make no mistake – they couldn’t have done it all by themselves. Polish voters alone supported this stadium with over 4,500 points, not mentioning votes from other countries. Anyhow, all we have left to say is: Congratulations, Stadium of the Year 2012!